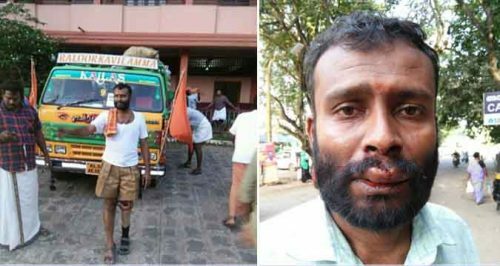 Communist Party of India (Marxist) CPM assailants unleashed a brutal attack on differently abled RSS Swayamsevak, Anoop who led relief activity of Seva Bharati in flood-hit Chengannur, in Kerala. Anoop, a native of Thiruvananthapuram, was one among the thousands of Swayamsevaks who came to Chengannur and Aranmula to partake rescue and relief activities coordinated by Seva Bharati. A group of assailants attacked Anoop on his way back to home. He suffered serious injuries to his face and mouth after having a narrow escape from a murder attempt allegedly made by a group of Democratic Youth Federation of India (DYFI) activists. Besides inflicting injuries, the callous assailants destroyed his prosthetic leg. “I don’t know why they dismantled my prosthetic leg, which enabled me to walk for long…” Anoop said in a Facebook post. For the last few days, social media have been celebrating Anoop like a hero for leading selfless service activities despite his physical limitations. RSS Seva Bharati swayamsevaks have been rendering an exemplary service to the flood victims in the region. CPM and other socio-political organisations are on the defensive as they have failed to take control over the situation even it’s been two days since flood water receded. To overcome the crisis, CPM cyber army has been flooding social media with hate messages targeting RSS. Chief Minister Pinarayi Vijayan was also forced to appreciate some of Swayamsevaks individually for their unparalleled service. He also remembered the Swayamsevaks who sacrificed their lives during rescue operations, without mentioning the organisation or banner under which they assembled for rescue operations. These could be the reasons which promised CPM goons to prey on the hapless victim. As a social worker, Anoop has filed a police complaint, but no action has been taken so far. People cutting across political lines have come up in arm against the gruesome act perpetrated by the ruling party.